AFTER Storm Imogen, is it not time more people faced up to the reality that man-made climate change is causing huge changes to weather patterns which are affecting us? One storm does not equal climate change, neither does one hot summer. The point is that unusual weather events are becoming more frequent – THAT’S climate change. 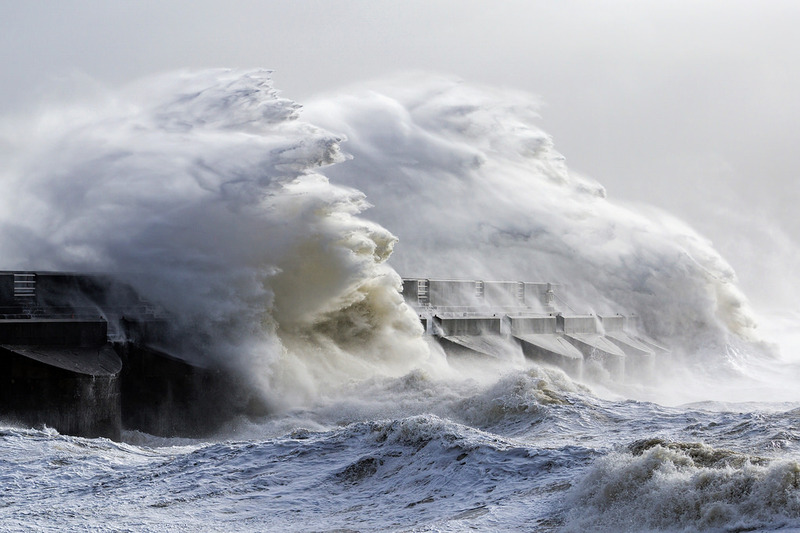 Imogen was the ninth named storm to hit the UK this winter. Before Imogen, we had the likes of Frank and Gertrude battering the country. 2015 was the hottest year since records began – the average surface temperature of the planet was 0.87°C warmer than the official baseline. Waves crashing against the breakwater at Brighton Marina. Photo credit: Hehaden/flickr Creative commons. This isn’t just a blip; global temperatures have been on an upward trend for years and 2011-2015 was the hottest five-year period on record. The weather is getting weird compared to what we’re used to. This isn’t happening by chance, it’s not ‘Nature’s way’. There’s a lot of folk working on climate science around the world and the vast majority agree that climate change is caused by human activity. This unusual weather – increasing temperatures, storms, droughts – is down to us. The knock on effects of this weird weather – melting ice caps, flooding, damage to health and property – that’s down to us as well. Why? Because we’re changing the planet’s atmosphere. Over the last century, a by-product of various human activities has been the release of carbon dioxide and other so-called greenhouse gases. These gases block energy from leaving the atmosphere, warming the planet. The main culprit is fossil fuels. When we burn them, we release carbon dioxide. Deforestation is important too because trees store carbon. When we chop them down we lose this storage capacity, releasing carbon dioxide into the atmosphere. There are other greenhouse gases too such as methane. This is released from the livestock we keep as part of their digestion process. It’s not all bad, however. The impacts of climate change are many and diverse. Whilst some people lose out, others may benefit from lower heating bills in winter for example. Carbon dioxide helps plants grow which brings opportunities to harvest more crops in some parts of the world. But the more this carries on – the more greenhouse gases we pump into the atmosphere – the more these impacts become increasingly negative. The bad outweighs the good. It’s difficult to be precise about exactly how bad things might get in monetary terms. Climate science and climate economics are not the same thing. There are fewer people working on the economics of climate change and they often don’t look at all possible climate impacts. Current best guesses suggest that we will lose out on between 1 – 10 years of economic growth in the 21st Century because of climate change. Although much of this is difficult to predict, we do know that there will be both winners and losers. People in less developed countries are and will continue to suffer most because of climate change and have the least means to do anything about it. Like any sentient species, humans are intrinsically motivated to try and make themselves comfortable, to acquire food, to keep warm. And so we should. We need to survive and, if possible, we’d like to thrive. But we’ll need to increasingly meet our needs in ways that don’t backfire and end up hurting us. There’s increasing public and political will behind tackling greenhouse gas emissions. One way of achieving this is through renewable energy like wind and solar. But large-scale technical and social changes aren’t easy. We’re locked in to a fossil fuel based economy, which is protected by powerful interests that hold back the growth of renewables. Another way to cut emissions is to increase energy efficiency. But this isn’t as straightforward as it first appears. For example, if your new car is cheaper to run because it uses fuel more efficiently, you might decide to use it more. This is called the rebound effect and it’s the focus of my current work. But, there are always challenges with any major change and we need to remember that progress is being made. We now get around a quarter of our electricity from renewables in the UK and best-guess estimates for the rebound effect do not suggest it is large enough to warrant abandoning energy efficiency efforts. Overall, the weather really is changing and the more it changes as time goes on, the more we can expect the impacts it causes to be increasingly bad for more and more people. Further moves towards carbon-neutral renewable energy sources has the potential to re-engage communities by involving them in the production of energy. And energy efficiency improvements save people money. More of an emphasis on these and other benefits of change is a good way forward. This was first published in The Argus on February 13th. Find out more about the ‘direct rebound effect’ associated with personal car travel in Great Britain – read this blog for an overview or read the full research paper in Energy Economics.